Hallowed Grounds is here to help you spice up your life with our new line of spices from Spiceology! Spiceology products are all natural, gluten free with no MSG and are low sodium. Spiceology spices are not just for the grill; throw some on your popcorn or french fries or add some to your next baking adventure. The versatility of Spiceology spice rubs is endless! For recipe inspiration visit their web page at spiceology.co. At Hallowed Grounds we know that variety is the spice of life, so we are pleased to carry 12 different blends to add more flavor to your cooking! Chef owned and operated, Spiceology spices are ground fresh and packed fresh guaranteeing you the freshest flavor. Spices not only add flavor, but also rev up your metabolism and boost your immune system with antioxidants. Right now you can only get these delectable spices in our New Brighton store, but we will be adding them to our online offerings shortly. Spices make great gifts to inspire the aspiring gourmet in your life. 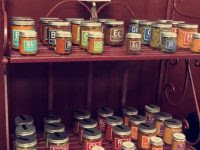 So, do something nice for the love of your life by giving a gift from our new line of specialty spice blends by Spiceology at Hallowed Grounds.  Archived in Hallowed Grounds.